Any regatta win is sweet but for Josh Porebski and Trent Rippey it tastes even better when it’s over their trans-Tasman rivals and that’s what they will be chasing tomorrow on the final day of the Oceanbridge NZL Sailing Regatta at Murrays Bay. The New Zealand pair are sandwiched between a pair of Australian crews in the 49er, two points behind leaders William and Sam Phillips and one point ahead of David Gilmour and Joel Turner. Porebski and Rippey sailed consistently well today in 12-15 knots of breeze, picking up two race wins and never finishing outside the top four in today’s five races in the 15-boat fleet. 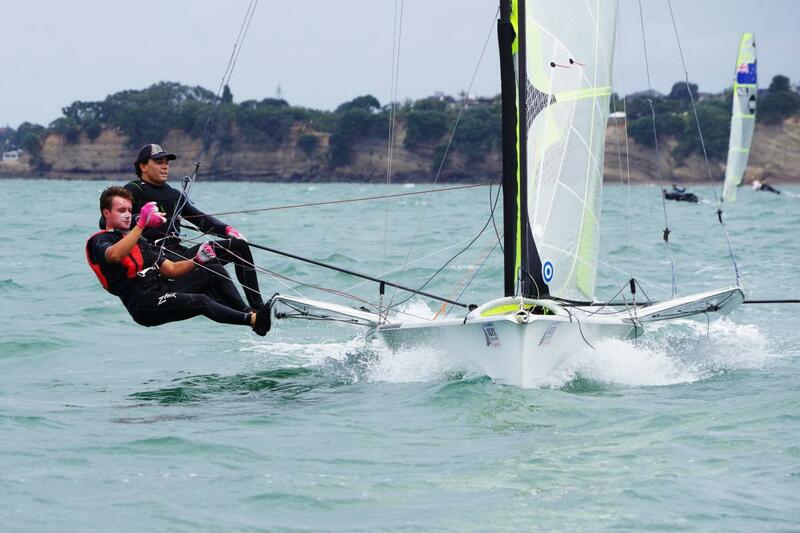 The 49er is one of the most competitive classes at the Oceanbridge NZL Sailing Regatta and has attracted a handful of top Australian crews and it’s translated to good rivalry on the water. Lighter winds than the first two days are forecast tomorrow but Porebski said they haven’t minded the big breezes. New Zealand’s top Laser sailors are also preparing for the European season and Sam Meech and Tom Saunders continued their close battle. Meech got the better of his fellow NZL Sailing Team member today with three wins and a second and will go into the final day with a one-point advantage over Saunders. Gemma Jones and Jason Saunders hold the lead going into the final day of the Nacra 17 class, but the scoreboard didn’t tell the full story of the day. Liv Mackay and Micah Wilkinson went to the aid of Christian Stephenson on the final race after the Dane had his leg sliced by the foiling catamaran’s rudder. Stephenson’s trapeze hook broke, sending him over the side of the boat and into the path of the rudder. He was taken to hospital and was expected to undergo surgery and is likely to be off the water for some time. The class is under the spotlight after switching to foiling catamarans for the 2020 Tokyo Olympics and this incident will prompt more discussion about safety after an American sailor lost three fingers last year.